Christian gives a brief account, after being "transhipped into canoes and catamarans," of landing through the surf on Mangaia in the Cook islands. Next morning, at daylight, we were awakened by the firing of a gun, having reached our destination. Mangaia is, in area, about 30 square miles, with a population of 1,400 Maoris and five Europeans, one of these being a Missionary. 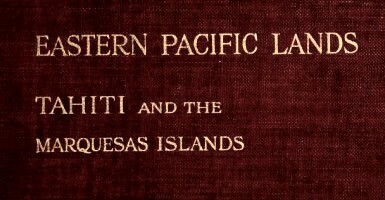 It lies about a hundred miles east of Rarotonga. practicable in canoe or catamaran. To us all, it was extremely exciting ; as it was necessary there should be a guard of honour, also a number of blue jackets ashore, it was a serious business. over the reef, and left stranded, a large number of natives rushing up to us, and, in the seething water, hauling us gradually into safety. with an introduction, by Carrie G. Ainsworth. 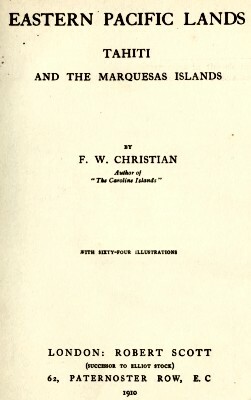 Published 1922 by Ainsworth & Company in Chicago . by right and left, as with us. the milk-white manes of their furious coursers.